Posted in English, myEnglish and tagged Bengaluru, British Council, British Council India, Communication, English courses, launch, Mumbai, myEnglish, technology on January 15, 2016 by Neenaz Ichaporia. Students of English in Mumbai and Bengaluru now have a reason to celebrate. The British Council marked the launch of its pioneering blended learning programme in these cities on 12 January, 2016. myEnglish combines the latest education technology and student-centred classroom instruction to improve students’ language skills, and more. The courses also foster essential 21st century skills such as time management, independent learning and critical thinking. While the courses are now available to more students across two new cities, they have been running successfully in Pune since May 2015. The formal launch event in Bengaluru was well-attended as several eminent panellists joined members of the press and public for a discussion on ‘Better English, Better Opportunities’. The panel comprised experts from the world of business, education and technology; including Arvind Katageri (Senior Manager, Centre for Behavioural Excellence – Talent Transformation, Wipro), Ashwani Sharma (Country Head, University Relations, Google India Pvt Ltd), Lalitha Murthy (Consultant, Business English, Tata Consultancy Services) and Nirupa Fernandez (Assistant Director, English, British Council). A lively dialogue ensued as the panellists discussed the role of English in the world of business. Lalitha Murthy from Tata Consultancy Services pointed out that while many new recruits may be confident about their English skills, what they may lack is the communicative competence required in the business world. Another topic discussed was the role played by technology in education. As Ashwini Sharma from Google pointed out, “Even a pen is technology” and in the debate that followed the panellists concluded that technology had always been present in education and that teachers have a responsibility to keep up with developments. The launch was also attended by two myEnglish students, Ramchandra Kulkarni and Vishal Chandegave, who spoke eloquently and positively about their experiences on the course and about how it has helped them be more confident in their professional and daily lives. Read more about their experiences in The Times of India and the Deccan Herald. 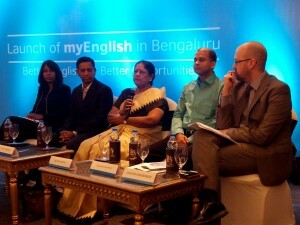 The myEnglish launch event in Bangalore was accompanied by a simultaneous press release in Mumbai and has generated a lot of interest among the press in both cities, with coverage in major publications including the Times of India, the New Indian Express, the Deccan Chronicle and the Deccan Herald. Several news websites and regional publications also covered the event. For more information on myEnglish, please visit our course page. If you want to register for a course, please leave your details here and we will get back to you. Posted in Arts and tagged A is for Arsenic: the Poisons of Agatha Christie; books, Agatha Chrsitie, British Council, Crime, Crime Writers Festival, Kathryn Harkup, New Delhi, Thriller on January 8, 2016 by Debesh Banerjee. Agatha Christie had most certainly one poison for every occasion. As her tally of “killings” in her novels reflects that a total of 100 killings out of 300 were committed by poison. As a former volunteer nurse in World War 1, Christie had gained extensive knowledge of her chemicals. No wonder she used them to good effect to eliminate her characters. In her debut non-fiction book , A is for Arsenic: The Poisons of Agatha Christie chemist Dr Kathryn Harkup reveals her passion and respect for the work of Agatha Christie. In this blog post, Harkup shares some interesting trivia & lesser-known facts about Christie and her use of poison through her fiction series. Christie used more poisons and more often than any other crime writer. Her toxic tally is over 30 different killer compounds. She killed over 300 characters, over 100 of them by poison. She consistently displays an impressively high degree of accuracy in her use of poisons. Christie trained as an Apothecaries’ Assistant during WWI which made her very knowledgeable in chemistry as well as dangerous drugs and different prescriptions that were available. Her first novel, The Mysterious Affair at Styles, written when she was working in a hospital dispensary, used three drugs to kill the victim (bromide powders, a narcotic and strychnine). She was complimented on her accuracy by a reviewer in The Pharmaceutical Journal, a review she was said to cherish above all others. Her novel The Pale Horse used thallium, a very unusual poison. The plot was similar to some aspects of a real-life poisoning case, Graham Young who poisoned several of his work colleagues with thallium, and it was suggested Christie may have inspired him but he always denied it. But the novel may have saved two lives because the accurate descriptions of thallium poisoning symptoms alerted doctors to the true cause of a young girl’s mysterious illness. Christie often used real-life murder cases as inspiration for her plots. Aspects of the Dr Crippen poisoning case appear in Ordeal by Innocence. The arsenic in the cake in After the Funeral is similar to the Marie LaFarge case. The suspected arsenic poisoning in Murder is Easy is very similar to the Armstrong case. 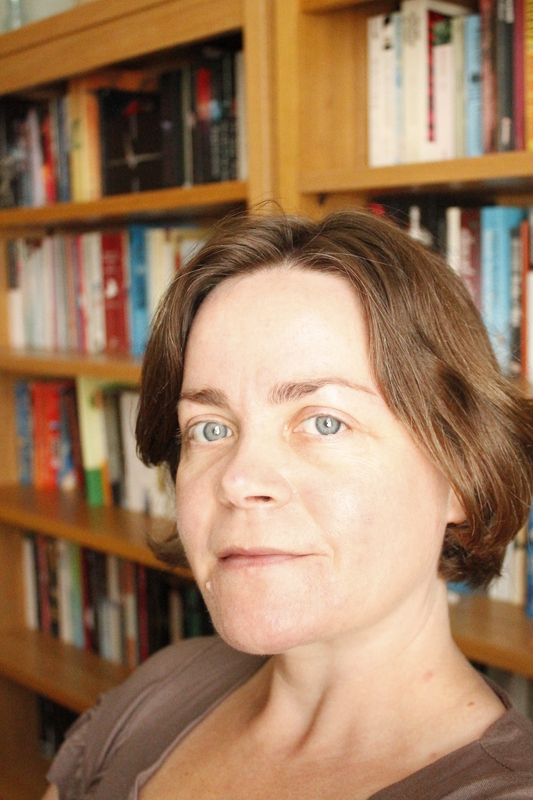 *This post was contributed by Dr Kathryn Harkup who will present her session at the Crime Writers Festival at the Apeejay Kolkata Literary Festival on 15 January & on the 17 Jan at the Oxford Books store, Connaught Place, New Delhi.